Belgium's love of wacky humour and comic book art come together in this wonderful museum housed in a fabulous Art Nouveau building designed by Victor Horta. Permanent exhibitions detail the history of European comic strips, while ever-changing temporary exhibitions focus on specific artists, time periods, and political contexts. 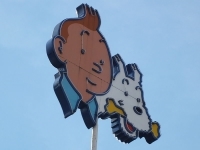 Visitors can see plenty of its most famous subject, Hergé's Tintin, as well as the Smurfs and art from over 670 cartoonists. This is a temple to cartooning, now considered an art form worthy of serious consideration, and so the museum aims to trace the history and development of the discipline rather than to entertain. Guided tours are available for larger groups. Opening times: Tuesday to Thursday 10am-5pm, Friday to Saturday 10am-6pm, Sunday 12pm-6pm. Admission: €8 adults, €6 children 12-18. Other concessions available.